Award-winning wellness destination, Peninsula Hot Springs, is set to attract up to 650-750,000 annual visitors to Victoria’s Mornington Peninsula with the unveiling of its highly anticipated $13 million Bath House Amphitheatre this weekend. Bringing a new level of health, wellness, learning and cultural offerings to the Mornington Peninsula, the project is Peninsula Hot Springs’ biggest expansion to date, with the new facilities cementing the business’ position on the global health and wellness map. The Bath House Amphitheatre was officially unveiled on Sunday 29th of July 2018 by the Assistant Federal Minister for Trade, Tourism and Investment, the Hon. Mark Coulton MP, the State Minister for Tourism and Major Events, the Hon. John Eren MP and Mornington Peninsula Shire Mayor Councillor Bryan Payne. The new area includes an Australian-first -10°C ice cave, -25°C deep freeze and sauna experience known as ‘Fire and Ice’ that draws on the hot and cold therapy phenomenon, providing a unique wellbeing and healing experience for guests. Drawing on ancient and new therapies used across the world, Peninsula Hot Springs has tapped into the latest trends in healing for its expansion, with the inclusion of seven new hot spring pools, two cold plunge pools, an outdoor stage, food bowl, new café, wellness centre and cultural meeting spaces to accompany the fire and ice experience (see further information attached). One of the largest untapped resources in the country, Co-Founder and CEO of Peninsula Hot Springs, Charles Davidson, explains that hot springs are fast being recognised in Australia as a means of healing, health and wellbeing. “Across the world hot springs have offered wellness experiences that provide lasting physical and mental health benefits. Our new Bath House Amphitheatre will not only build on our current bathing offering but will also provide guests with a means to refresh and rejuvenate their mind, body and soul allowing them to reconnect with nature and the community,” Charles said. “We have expanded to allow for additional guests to visit the hot springs and to ensure each visitor will experience even more diverse globally inspired experiences that have never been seen before in Australia and in some cases internationally.” With many bathing cultures represented at Peninsula Hot Springs, care has been taken to ensure guests are educated about each experience and its origins, with numerous cultural learning activities incorporated across the site. This includes a new cultural meeting space, created in collaboration with Boon Wurrung Elder Aunty Carolyn Briggs and Yuin Elder Uncle Max Dulumunmun, that has been designed using sacred principles and will be the stage for many future events. Assistant Minister for Trade, Tourism and Investment, the Hon. Mark Coulton MP, has welcomed the opening of this new stage in Peninsula Hot Springs’ expansion. 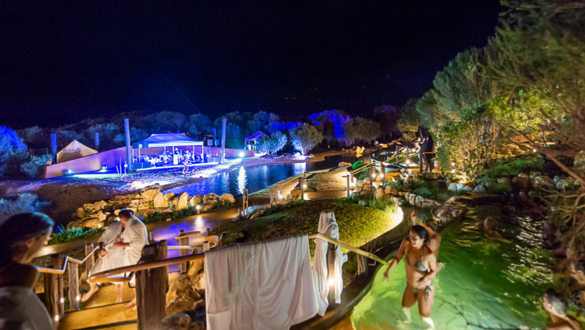 “Peninsula Hot Springs is a highlight for both the Mornington Peninsula community and for Victoria’s tourism industry more broadly. This expansion will generate new opportunities for local jobs and regional tourism, and further enhance the unique natural wellness experience that visitors can enjoy here,” Mr Coulton said. Operating since 2005, Peninsula Hot Springs has grown at 20%+ per annum since its inception and currently receives 480,000 annual visitors per annum. The unveiling of the new amphitheatre area enables the commencement of Peninsula Hot Springs future onsite accommodation facilities with glamping and 126 rooms of accommodation available within three years. Private lodges will be suitable for couples and groups of up to 14, as well as larger condominiums with double rooms and capacity for 30 people. The new Bath House Amphitheatre will be open to the public in September. For more information on Peninsula Hot Springs’ new Bath House Amphitheatre or to book your experience, visit www.peninsulahotsprings.com. Positioned throughout the amphitheatre, seven new geothermal mineral spring pools have been designed to look out over the lake and stage area. Guests will be able to relax and take in the scenic surrounds or enjoy an array of entertainment on the new open air stage. Underwater speakers have been fitted into each pool for guests to enjoy the music and entertainment even whilst floating in the healing waters. The selection of new pools includes an aquatherapy pool which will encourage guests to experience floating treatments. Water therapies promote a deep state of relaxation by creating great change in the autonomic nervous system and involve a therapist moving the guest’s body through the geothermal water in graceful, fluid movements. The stage within the Bath House Amphitheatre will host a variety of arts and entertainment experiences including musical acts, cultural talks, yoga and other wellbeing classes. This area can accommodate large private groups of up to 700 guests seeking to enhance their geothermal bathing experience with entertainment. The fire and ice experience celebrates the global phenomenon of hot/ cold therapy. Fire and Ice includes two new saunas with a capacity of 30 guests per sauna and is the perfect complement to the contrasting ice cave, deep freeze and cold plunge pools. Experience the saunas in combination with the Ice Cave and Deep Freeze to feel the benefits as your body regulates from hot to cold. The sauna experience at Peninsula Hot Springs will help you sweat out toxins, improve cardiovascular performance and sleep quality, cleanse skin, burn calories and fight illness. Based on the theory of cryotherapy, Peninsula Hot Springs has designed an Ice Cave and Deep Freeze. The Ice Cave will be kept between 2 to -10 degrees Celsius and the Deep Freeze will be -25 degrees Celsius providing daring guests with added health benefits including reduced inflammation, optimised brain function, improved sleep quality, increased metabolism and increased collagen production. The three-acre terraced garden will launch in stages over the coming years. The first stage of food production has begun and fresh, organic produce from the Food Bowl is being used in the onsite dining areas; Bath House café and Spa Dreaming Centre café, and the soon to launch Amphitheatre café. Vegetables planted to date include pumpkins, tomatoes, eggplants, and a variety of lettuce. Future plans will include the capacity to grow teas and medicinal plants that will be available for purchase onsite in the retail areas. When complete, the Food Bowl will have 7 long curved terraced areas, thermally heated glasshouses and an underground mushroom cave. It will also function as an event and meeting space with an anticipated capacity of 1,500 people. The new Amphitheatre café will be the third onsite dining area where guests can enjoy a fusion of seasonal, local, organic and whole (s.l.o.w) food. The indoor/outdoor café will focus on harvesting its fresh produce straight from our food bowl and will have a menu inspired by international cuisines, to complement the globally inspired bathing experiences. This multipurpose space will host a variety of wellbeing programs and activities including corporate meetings and functions, various wellness activities including mat and aerial yoga, Pilates, tai chi, meditation, massage, health & wellbeing talks, massage classes for groups of up to 28 and many more.